Believe it or not but the flooring in our laundry rooms take one of the biggest beatings out of any room in our homes. The choice of flooring you make for your laundry room really does matter! Whether you have brand new appliances or older models, all washers and dryers produce movement, heat, humidity and moisture. Therefore, if you want your flooring to last for years to come you should select a product that is durable enough to withstand these forces. To help you make the best possible decision we put together this guide of the best and worst flooring options for laundry rooms. Although the idea of doing your laundry on a soft and plush carpet sounds like a dream, carpet is simply the worst flooring option because of the health risks. Not only do the fibers in carpet trap dust and dirt but wet or moist carpet is the perfect environment for dust to reproduce and grow into toxic mold. Who doesn’t love the look of hardwood throughout their entire home? Well sadly, solid hardwood and laundry rooms are not a good match. The high levels of moisture, humidity and threat of water damage are a few of the reasons why hardwood should not be used in your laundry room. Add heavy appliances and a ton of vibration and you are asking for a flooring disaster. Your floors will look amazing at the beginning but eventually the movement and vibration from your appliances will cause your hardwood to scratch and dent. Fortunately, if you have your heart set on the look of hardwood floors there are a ton of more suitable flooring options, which we will go into more detail shortly. Laminate comes in many different styles and is a good flooring choice for living rooms, family rooms, offices or bedrooms. Laminate flooring however is not recommended for areas of your home that are at risk of water leaks and damage. Despite the claims that laminate is water resistant, it will not be able to hold up to leaks. Water will seep and absorb into the core material, damaging your flooring and causing it to warp. You will eventually need to replace your laminate flooring if there is water damage. Calling all hardwood flooring lovers! If you are one of those home owners who loves the look of hardwood throughout their entire home this is the product for you. Rigid Core flooring by Armstrong Flooring comes in many award-winning designs and styles that mimics the look of hardwood. Rigid Core is also a hybrid, meaning it is constructed with all the best attributes of multiple flooring types to bring you a more durable flooring product. When exposed to water Rigid Core flooring does not swell, buckle or lose integrity making it 100% waterproof. Rigid Core is packed with characteristics that make it perfect for a laundry room. Sheet vinyl is one of the most waterproof materials available. It also comes in many unique styles, designs and colours so you are sure to find a product you love. Although sheet vinyl is water resistant it does not hold up as well to dropped objects as well as moving large appliances, such as your washer and dryer, which can damage and scratch the surface. Sheet vinyl is a great flooring solution for laundry rooms because it is low-maintenance, less expensive, and easy to clean. If you are wanting something a little higher end for your laundry room than you will want to consider luxury vinyl. 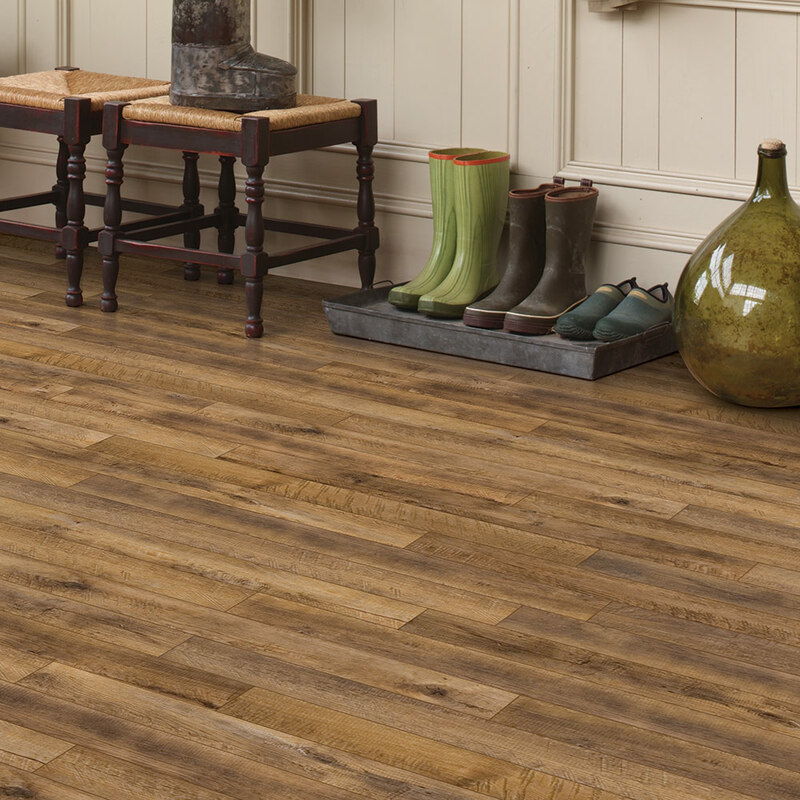 ADURA Vinyl Plank Flooring by Mannington is a luxury vinyl flooring product that is waterproof, kid and pet friendly, easy to clean and maintain, and has exceptional durability and performance that you will only find in luxury vinyl products. This is also another great solution for home owners who love the look of hardwood as luxury vinyl is available in a variety of shapes, sizes, and textures to mimic hardwood. However, you can also get stone and tile looks as well. Tile, hands down is the most durable flooring option for your laundry room. Tile is so versatile with a variety of looks, shapes, sizes, textures and colours available you will be sure to find a look that you love and is unique to you. You can’t go wrong with choosing tile for your laundry room due to its incredibly durable and waterproof characteristics.